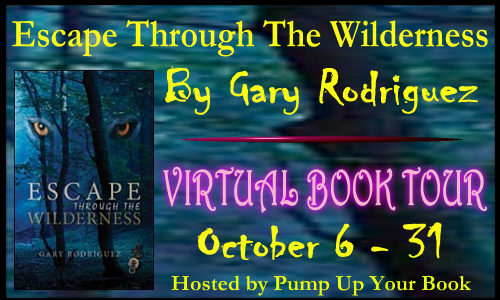 Today, thanks to Pump Up Your Book tours, we get a sneak peek at ESCAPE THROUGH THE WILDERNESS by Gary Rodrigiuez. About the book: Sixteen-year-old Savannah Evans walks with a slight limp thanks to a gymnastics’ accident that dashed her Olympic dreams, but didn’t stop her from attending an adventure camp in Idaho. At Camp Arrowhead, she quickly befriends Jade Chang and Rico Cruz, but Conner Swift taunts Savi because of her injury. When the four are teamed together for an overnight white-water river rafting adventure, Savi refuses to get in the same raft with Conner. Unfortunately, the director will not reassign her. A fun expedition down the river turns into a nightmare when their raft slams into a huge rock and their adult guide disappears down the river. Without their guide and desperately trying to steer an out-of-control raft, they pass the “Last Chance” marker and enter the larger rapids. With Jade pinned between the raft and a rock, and Rico clinging to a lifeline, Savi must cut the raft free. When the four drag themselves out of the river, they’re bruised, beaten, lost, and twenty-five miles from camp. Because of late-night campfire tales of Vexel, a vicious animal that roams the nearby woods, Savi and the others are terrified. Savi becomes the unlikely leader who tries to guide the group back to Camp Arrowhead. Limited supplies, injuries, and the constant threat of Vexel—who Savi fears is stalking them, complicate the harrowing return trip. Readers will enjoy dramatic survival scenes and the group working together, solving problems, and learning to overcome adversity. The river turned slightly to the right and then they saw the nightmare ahead. The turbulence was like nothing they had seen before. The water appeared completely white and rushed forward at a furious pace, breaking over and against rocks on both sides. The only way through was a narrow slot between the rocks, which they needed to hit just right, to make it through safely. “Watch for rocks,” Doug warned with a shout. “And hold on!” As they shot through the tight gap between the rocks, water rose above the raft on both sides. They flew through the first surge and then saw the river bend slightly left between a new set of obstacles. “Paddle left!” Doug yelled over the thunderous roar. “Hard left!” he shouted again. “Rock!” Savi screamed. Water drenched them from every direction. Conner removed his right hand from the paddle for a second to wipe off his glasses. “Rocks left!” Savi shouted. Gary Rodriguez is president of LeaderMetrix Inc., a consulting company that specializes in senior-level executive coaching, organizational development and conflict resolution. 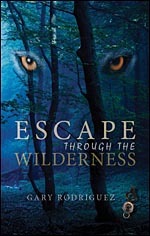 He is the author of the new adventure novel Escape through the Wilderness scheduled for release in June 2014. His first book Purpose-Centered Public Speaking was an instant hit and recently republished by Tate Publishing. His extensive resume includes eighteen years as an executive in the radio business where he spent several years as one of the original managers of Infinity Broadcasting. He was twice nominated as medium market manager of the year by the Bobby Poe report, a national media publication. For over thirty-five years, Gary has spoken in public both nationally and internationally. Gary’s resume includes a season in the U.S. Army where he was highly decorated as the youngest Drill Instructor in the Army's history at age 18 years. He was also awarded the Silver Star (the nation's third highest award for valor) while serving in Viet Nam. Visit the book’s website at http://ettw.tateauthor.com/ You can also find Gary at http://leadermetrix.com/ and http://www.leadermetrix.com/authorspeaker.